The Chopin Foundation's mission is to assist young American pianists in their career development and to make classical music accessible to all. Eric Lu's performance during the semi-final round of 2015 National Chopin Piano Competition where he won first prize. He returns to Miami for a performance on May 15, 2016. Held at the La Gorce Country Club on Miami Beach, the Salon Concerts are an intimate gathering of Chopin lovers and feature outstanding pianist from around the world. The 2015-16 series will present 3 jurors from the 2015 National Chopin Piano Competition who have great careers as performing artists. The concerts are followed by a meet-the-artist wine reception. Up to ten #1,000 scholarships are provided for continuing piano studies to students between the ages of 14 - 17. The scholarships are renewable for up to four year and are awarded on a competitive basis with applicants exhibiting a special affinity for the music of Chopin. 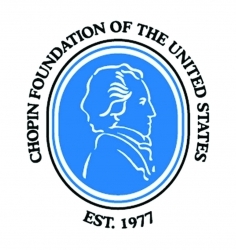 Learn more about Chopin Foundation of the United States Inc.